At the beginning of the school year I wrote about how I introduced my first rejoinders to the class. By this time of the school year, my students have a variety of ways to respond to different situations, what I say or what we read. But I’m still training them. They’re not where I want them to be yet. 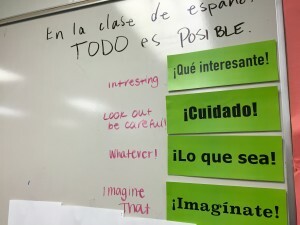 Their engagement and motivation to use the language is still quite strong, so I still haven’t introduced any extrinsic motivator like you may have seen at #iFLT15. Even so, I still sometimes get the deer in the headlights look in response to statements and questions I make. Remember, my students are expected to respond in a way that I can observe to every statement I make or question I ask. I now have three areas in my classroom dedicated to rejoinder posters: The Bank, Active Learning, and Mastery. The Bank is the database of many of the rejoinders we will learn this year. The second is the Active Learning space for expressions we’re currently learning. The third is the wall of mastery. This is where the expressions go after I am convinced that 80% or more of my students know them and can use them in appropriate contexts. I have many expressions posted on the cabinets on one side of the room that gets little use. They aren’t obvious because they are obscured by the white board on wheels that I use for extended or enrichment vocabulary. The students know they are there, but they’ve never been introduced to the class. They are present but unknown, waiting for their turn to move to the Active Learning spot. There’s something really neat about having rejoinders we’re not currently learning already posted on the wall. I see students congregating around the list during passing time. I hear them sounding out the expressions and making guesses as to their meanings. Sometimes they shrug and walk away. Occasionally they ask me what one means and I tell them. And you know what that means. Their own curiosity is driving their learning. They then take these expressions and use them. First, they use them with friends in passing time, at the cafeteria and in the locker bay. But they also use them in class and show them off. They are the only ones who know what these new expressions mean. Most of the kids don’t know. When you are the only one who knows something and you share it, and it garners a positive response from the teacher, that validates your use of the expression. It makes you feel special. You are now the early adopter of that expression. You are the innovator. You own that expression. It’s yours. And when we teach it to the other students, you get the credit for having brought that into our common knowledge. Interestingly, this is not something that I plan for or train my students to do. It just happens. They are human and thus they are creators and innovators by nature. They do this on their own account. I tend to have four or five expressions at a time posted vertically on the right edge of the whiteboard with their meaning in English written next to them in white board marker. I underline it again but this time in syllables: I MA GI NA TE. I underline it again but this time with rhythm. Finally, I turn to the class begin to snap at a slow rate, and begin to chant the word. When I do this, I am snapping with my right hand. I am pointing to my ear with my left. I say the word pointing to my ear and then with my left hand I give them an open palm, indicating that it is their turn to return the chant. We do it two or three times. Then I increase the pace. A little bit faster. Then, with a funny voice. They mimic the tone. If they don’t, I stop and say, “Class, mimic my tone, please.” Next, I find a way to elicit that response in context. Class, I say, Tommy has 113 sisters! Open palm to the class and they say to my cadence with the snapping, “Imagine that!” All told this probably takes 3 to 4 minutes. The second rejoinder I introduced was “¡Lo que sea!” (whatever!). I did the same thing as with the first. Pointing first to it’s English meaning on the whiteboard, then underlining the expression slowly. No sound yet. I reminded students to make a hypothesis about it’s pronunciation. I returned to underlining it by syllable. When I got to the word sea, I paused and said to the class in English, “Class, remember in Spanish when you see a vowel, you say a vowel.” I underlined it one more time and then went back to the class, snapping with my right hand pointing to my ear with my left and said the expression with rhythm having them repeat it twice or three times. T: Class, Carly has 200 cats at home! T: Class, Jeff likes to eat platypus! T: Class, Zayn doesn’t sing with One Direction anymore! To each of these, the students responded with either of the two expressions, whichever they felt was the appropriate for the context. After I presented all three of these, I picked up a stuffed globe that I have for geography games. It’s about the size of a soccer ball, but it’s stuffed and soft. 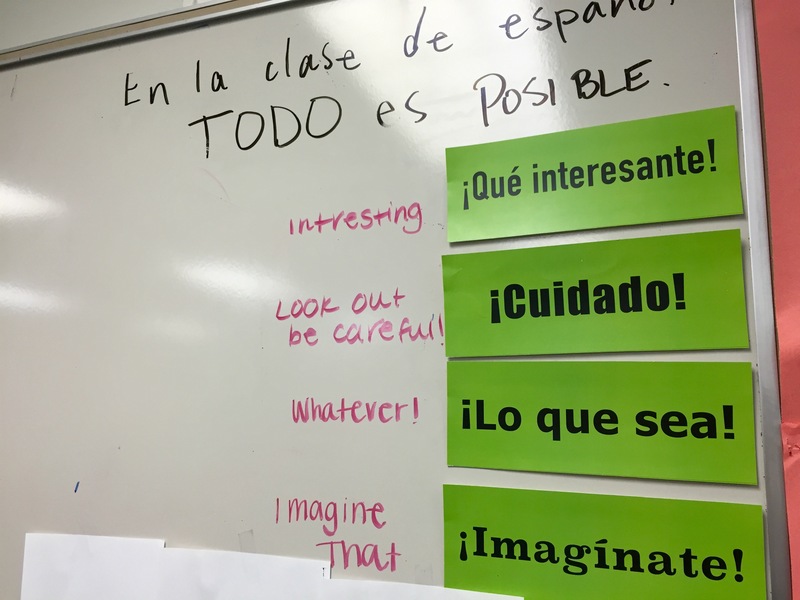 I introduced the expression, “¡Cuidado!” and quickly put it to use by shouting “¡Cuidado!” and tossing the ball at a student. They sit in their chairs with nothing in their laps or hands. So, responding to this soft ball coming at them was quite easy. After I threw it a few times and had kids pass it back to me, I then encouraged them to throw the ball at each other. But I said, in the TL, “Clase, ¡Cuidado! Primero se grita ¡Cuidado!. Segundo se lanza el balón.” And I modeled it once more, slowly. I always avoid modeling the wrong behavior. Just model what you want to see. 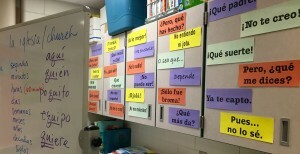 Once I’m convinced that my students know the 4 or 5 in the Active Learning space, I move them over to the Mastery wall. There is no English accompanying the expressions on the mastery wall. They’re there for reference and I occasionally will Point and Pause to one that’s appropriate in the moment that I didn’t hear any students use. 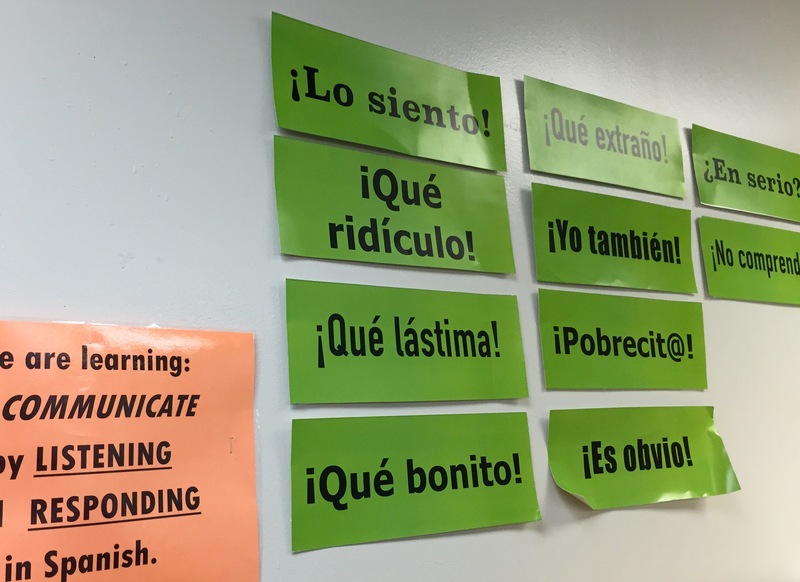 These will stay up all year and will grow as the year goes on, organically, according to the expressions needed to make communication happen. I know a lot of people are working with rejoinders of all types. Some people categorize them. I haven’t found that to be exceedingly helpful for my students. But I did find it to be time consuming for me. So, I don’t do that anymore. I do try, however, to make sure I have expressions available for different personalities, different contexts, different emotions, etc. So, how are you using rejoinders in your class to help students communicate effectively, accurately and in their own unique way? ← The Secret Password: Can Exclusion Lead to Inclusion? What does your color coding of the different rejoinders denote (or just for decoration?) I have only two colors – green for ‘positive’ rejoinders, i.e., , ¡Claro que sí!, Fantástico, Es obvio, Qué emoción, etc; and red for ‘negative’ rejoinders, i.e., ¡Claro que no!, ¡Qué asco!, No es justo, ¡Mentira! I love the idea of moving them around the room from novice to active to mastery, and leaving some new ones up there ready to be employed in the moment. Thanks for your comment and for reading! The posters I have in the Bank are prototype posters so the colors don’t match the colors I have on my store. The colors in the store are green, yellow, red and blue. They aren’t categorized by positive or negative, but rather by what time of the school year I tend to introduce them. Green are the first 2-3 months-ish or so. Yellow are usually late Nov-Janish. Red are usually Feb-Marchish and blue is usually toward the end of the year. Pingback:22 Chinese Interjections You Oughta Know! Why do You Teach Languages? Unauthorized use and/or duplication of any material without express and written consent from Grant Boulanger is strictly prohibited. Excerpts and links may be used, provided that full and clear credit is given to Grant Boulanger / GrantBoulanger.com with appropriate and specific attribution and links to original content. Contact grantboulanger@gmail.com to request permission to use, duplicate, and/or distribute any content from this website. Though there are many languages I’m eager to discover, German has never been one. Yet as a beginning German student, I found myself drawn in and very eager to keep learning! Our class readings have emphasized the importance of narrative form and emotional investment for connecting students to lessons and helping them create meaning. I thought this was a bit unimpressive. However, it only took the briefest experience as your student for me to see otherwise. I’m grateful for the opportunity you gave us to sit on the other side of the desk and try being beginners again. I am without appropriate words to express how grateful I am for Grant's investment into my teaching career. I feel that I have been encouraged, stretched, challenged, supported, enlightened, and more. He is a wonderful mentor and colleague. I have directed the iFLT Conference	for several years, and 2015 was the first year we have ever had to turn students away! We had a waiting list of students who wanted to take classes, and that is a huge testament to Grant’s universal success in the classroom, his professional relationship with his colleagues and his stellar reputation in the community as an advocate and a catalyst for highly effective, all-inclusive language instruction. Grant knows the value of taking risks, and his growth is the result of unmistakable passion and an incredible work ethic. Grant is one of us that has worked hard over the years to develop his craft–and that can give all of us hope that we can get better too. Copyright © 2019 Grant Boulanger. Powered by WordPress. Theme: Spacious by ThemeGrill.